7.62 points at 60 votes (rank 170). Commando was put on the index in Germany due to glorification of violence. Therefore a new version with the title "Space Invasion" was released in which the hostile soldiers are replaced by white robots that remind of the Stormtroopers from Star Wars. You see the soldier that you steer from the birds view. The soldier runs from bottom to top whereby again and again a huge amount of enemies attack from the front and side. Many of them are also barricaded behind walls and stones and can only be driven from their hideout with grenades. However, they also leave the hideout as soon as you pass them. If you are hit by a hostile soldier, a grenade or a shot you will lose a life and start again shortly before the position where you have been hit. The forces are equipped very well. Next to the many men, they also have huge amounts of heavy weapons and vehicles at hand. In all three areas the security measures get constantly higher so that you proceed only with difficulty, therefore you should collect all the flashing boxes for more hand grenades. If you manage to make more than 1.000.000 points there will be a digit overflow and the game starts to recount from "000.000". 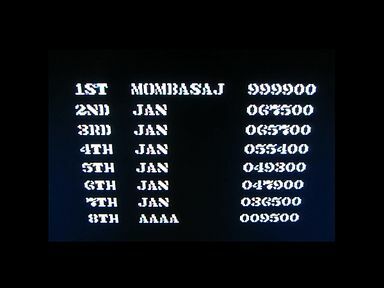 This is also valid for the entry into the highscore list!! The same phenomenon happens with grenades if you collect more than 99. Due to a multiplexing problem there is a notorious flicker and slowdown starting from a certain number of enemy sprites. The number of lives that can be reached is limited to 256 (more than enough). The counting is done in hexadecimals, but the display is decimal, that is why the lives display is sometimes weird (graphic characters). Numerous versions offer all thinkable trainer options. Dante: "Commando is a really good game with many diversified enemies. The game is rather short (partially some enemies do only appear once in the 3 areas), but you need some time due to the high difficulty grade. Music and graphics, however, are top and thus this is in any case one of my favourite games." mombasajoe: "Positive: one of the best music pieces that has ever come out of the C64, well playability, fast, nice graphics (a few sprite flickers are excusable). Negative: throwing grenade works with space key and this hinders the flow of the game, the game is too easy and much too short. 3 levels are just too few. Furthermore the levels are rather short. The only difficulty in the game: the end of each level (esp. level 2), in which hordes of enemies storm onto the player as a last array. The game is played to the end much too fast. Therefore only 6/10 points. For all levels of the machine I would have given 9 or 10. Too bad." Shakermaker303: "Definitely one of the games to which you connect the C64 (although it originally was an arcade version). The good Rob has once more applied his musical fingers very well. One of my personal music highlights from the times of the C64. But not only concerning the music, but also the gameplay it is the ultimate grand. The graphics are also quite good-looking, I like it better than the one of e.g. "Who Dares Wins". And who claims it is too easy? Not everyone is a born GI-Joe, gents. Everything is acquired laboriously during fights until I managed to get through for the first time. 10 out of 10 points is the minimum in my opinion. 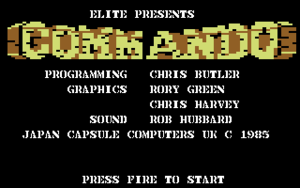 ;-)"
Blubarju: "I personally like the C64 version of Commando best; alone because of the great music by Rob Hubbard, which has more pep than e.g. the one in the arcade or Amiga version. The difficulty grade is very fair. Although I constantly dispair regulary with action games, I made it to play Commando to the end several times. Some minor critic from my side at the most for the short length of the game. But rather a funny and short game, than a long but boring one, don't you agree? ;-) 8 out of 10 points. H.T.W: "At that time the companies knew already how to help themselves when their game was indexed on the German market. The game "Commando" became "Space Invasion", only the sprites and the name were changed! Of course by this the Federal Republic was saved from an, errm, invasion of potential homicidal maniacs - and Elite Systems from a greater commercial success... But Invasion or Commando, there is one thing that perplexes me: What is a "Crack Soldat"? (see Space Invasion - Advertisement) How could they have made commercials for this stuff, it didn't even exists at that time... ;)"
TheRyk: "Though I still play it every now and then and have some silly nostalgic feelings for this game, mostly because of the music, you cannot really ignore the flickering and freezing sprites. It is not totally unplayble but at best an average shooter, which I rate so-so 4 points, because it is beaten the pants off by the far better Who Dares Wins." Up to 5 trainer options can be selected separately. Bugs and weaknesses as flickering sprites were not fixed. You can choose whether you want to play the original Commando or the Space Invaders release (not on the index). Up to 7 trainer options can be selected separately. As in the Arcade version, there are altogether 8 levels, so 3 more. extra title screen and start animation (helicopter puts Super Joe down at the start of the game and collects him again at the end of the mission) and further numerous graphical extras. There is also an EasyFlash version. These modifications are so numerous that this version is indeed closer to the arcade original, but it is a totally different game than the C64 Commando. E.g. the points system is also totally different. You cannot really call it a Crack, but rather an independent game. 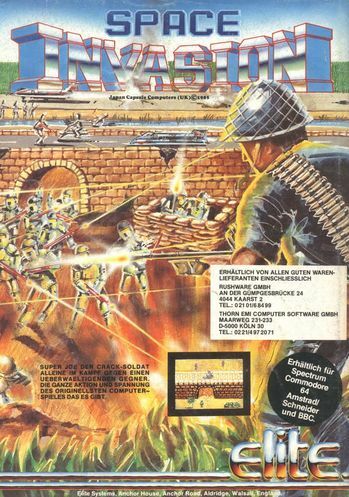 In March 2015 Nostalgia released a "Special Edition" ("Commando Arcade SE"), providing totally new graphics by STE'86 in addition to the features above. The game was taken from the German index in August 2005 by the BPjM due to time lapse (source ). The game was awarded with the British Golden Joystick Award in the category Arcade-Style Game of the Year in 1985. Commando is the realisation of a Capcom arcade machine. 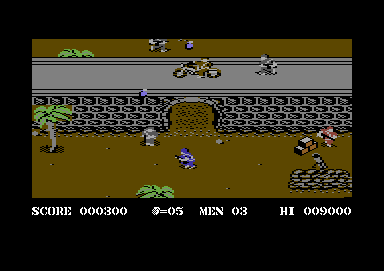 In contrast to the 8 levels of the original, the C64 version has only 3. 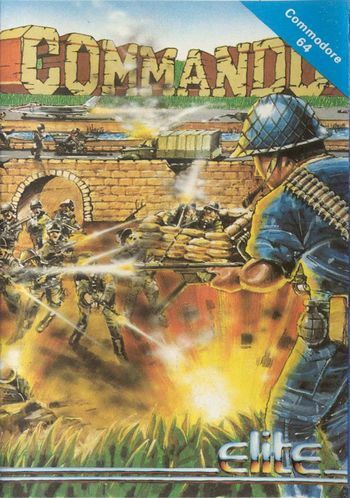 Elite used the license for Commando to publish a Gauntlet-clone named "Commando 86" a year later, with which Capcom has nothing to do. The official follower is the game "Mercs", which was released on the arcade machine at the end of the 80s. The C64 version was programmed by Chris Butler who at that time programmed several games by order of Elite. 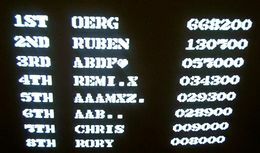 The fact that only 3 out of 8 levels were left in the final version could be connected to the alleged insisting of Elite that as with Ghosts'n Goblins the game should be completely in the memory. The music is by Rob Hubbard, who wrote a remix of the music on the arcade machine. In 2007, Rob Hubbard himself in person has created a cover version of the title tune with Propellerhead's software sequencer "Reason 4" after their request. The cover is second to none (see Commando#Links). The character "Super Joe" is also the protagonist in the Capcom game Bionic Commando, which, however, is not counted into the Commando series. Commando in the Killer List Of Videogames. This page was last modified on 24 March 2015, at 01:56. This page has been accessed 10,557 times.